Khan wants Pacman by end of 2013! by Jamil Akram: According to the Asian eastern eye newspaper it has been reported than Amir Khan is hoping to make a big statement next year by taking on Manny Pacquiao to prove to everyone including hall of fame trainer Freddie Roach that he has made the right move by moving camps and that he is the next big thing. I guess this is a dig at Roach to prove to him that he can beat his best fighter. I honestly think Khan is under some illusion or his team are give some crazy thoughts. I can’t see can lasting more than a round with Manny. 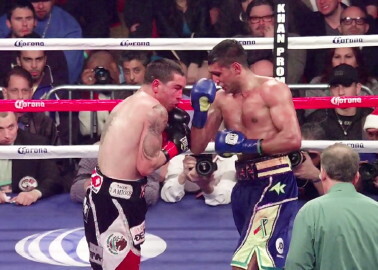 Both have similar styles but with Pacman’s power, Khan won’t know what hit him. It would be a very interesting fight with both styles. I think it could sell out the MGM in Las Vegas, Nevada. Khan thinks Manny is not the same old dedicated and illusive fighter. I am sure khan has thought about but with everything going on with Floyd Mayweather, he knows that’s what boxing fans want to see. Khan has to worry about his confidence before he think about any fighter. 2013 is a make or break year for Khan. Boxing » Amir Khan » Khan wants Pacman by end of 2013!